These rugged, welded steel dumping hoppers solve your wet or dry bulk handling needs. These steel dumping hoppers are designed for forklift handling. They dump from any height and are precisely balanced to tip forward for complete discharge of contents and return to an upright position. Welded seams insure a watertight interior for wet or dry use. A positive locking latch prevents accidental dumping. The 2 " formed top lips increase rigidity and eliminate sharp edges. A safety chain secures the self dumping hopper to the handling vehicle. 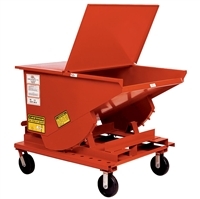 These self dumping hoppers for sale are shipped fully assembled and come in two colors, orange (standard color) and gray. CK620VR 6" x 2" 1,600-lbs. CK625VR 6" x 2.5" 2,000-lbs. CK820VR 8" x 2" 2,000-lbs. CK825VR 8" x 2.5" 2,700-lbs. CK620SS 6" x 2" 4,000-lbs. CK625SS 6" x 2.5" 6,000-lbs. CK820SS 8" x 2" 4,000-lbs. CK825SS 8" x 2.5" 6,000-lbs. CK620PH 6" x 2" 4,800-lbs. CK625PH 6" x 2.5" 6,000-lbs. CK820PH 8" x 2" 5,600-lbs. CK825PH 8" x 2.5" 6,000-lbs. CK620PU 6" x 2" 4,000-lbs. CK625PU 6" x 2.5" 4,400-lbs. CK820PU 8" x 2" 4,000-lbs. CK825PU 8" x 2.5" 5,300-lbs.